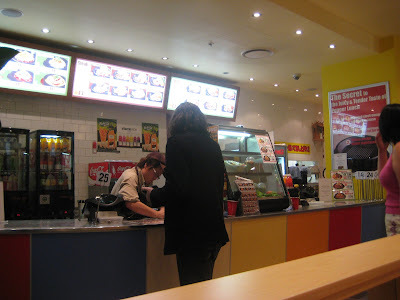 This isn't so much a review as a pictorial of my favourite take away in the city; the meals are cheap, quick, healthy and tasty and make a great bite before or after a movie at George St. These are just about everywhere in Japan and always stock high quality Australian and New Zealand meats which is astounding at the price point, there's only one that I'm aware of in Sydney and they still don't have an Australian website but the menu is much the same country to country. 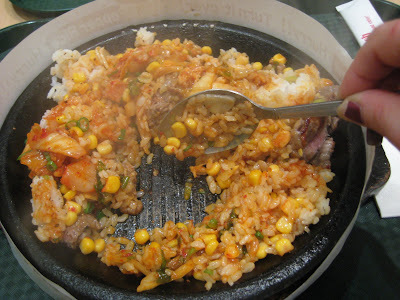 For me the whole point of Pepper Lunch is the signature dish of "Pepper Rice," a sizzling grill plate is electro-magnetically super heated and delivered to you with thin slices of meat surrounding a mound of sauce, butter and vegetables. You then get the joy of "cooking" your own food, flipping the meat and stirring through seasonings as you choose. 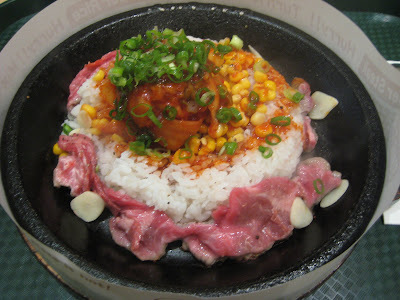 This order is a large pile of kim chi and buttered corn with white rice and thin fatty slices of meat, what I didn't get this meal is the J-curry special which is so good it makes me weep a little, but I was in the mood for something lighter. Optional sauces for addition aren't needed with the strong kim chi. If you're lost the protective paper on the grill plate comes with handy hints! Stirring through the Pepper Rice. 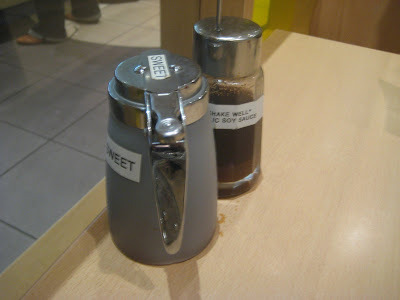 Other meal options on the menu are primarily quite plain combinations of meats and vegetables with a stir fry sauce but are hearty and plain for the fussy eater, or can be dressed up with chilli and sauce for those of us who like a little more spice. This is a take away establishment so treat the service as such, the only complaint if anything is that being one of the few Western eaters in the establishment they tend to treat you a bit like an idiot who couldn't find chopsticks with both hands and a Einstein's brain. I have heard good of this place! Have you noticed what their vege options are like? Yum. That looks fun too - I love cook at the table! Unless you eat fish you're going to need to modify the menu. I think if you asked for say the kim chi rice with egg instead of meat that would work though.